Despite the headlines, technology sector remained the top performing sector in Q1 2018. Is the tech sector expensive, or just FAANG stocks? The volatility we’ve experienced in 2018 is NOT abnormal from a historical perspective. 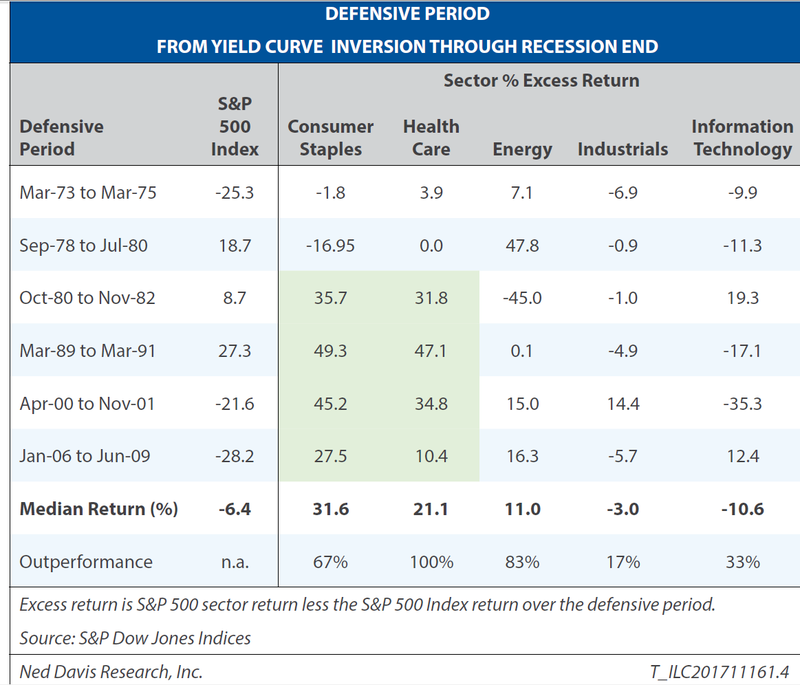 Sector rotation to defensive companies has not yet happened. Sonny made his choice in the movie, as all of us must, and it depends on your circumstances. 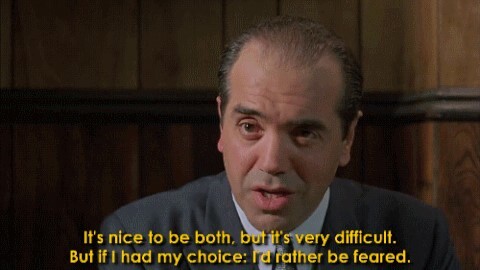 To my way of thinking, in Sonny’s line of work (organized crime), it is much more important to be feared. Sometimes you can be both loved AND feared, but only for a short period of time. Eventually the single dominant characteristic (loved or feared) will surface. run to the national semifinals. The Ramblers captured hearts of sports fans everywhere with an undersized roster of humble, selfless players including two lightly recruited guards that have played together since 3rd grade. Then there was Loyola’s telegenic spiritual advisor, Sister Jean, a 98-year-old wheelchair-bound nun who confounded the basketball experts and lit up the national TV cameras after each game with her smile, moxie and bold predictions. Last weekend, on Easter Eve, the Ramblers had joined big blue chips Michigan, Villanova and Kansas in the national semi-finals, marking the school’s first appearance in the Final Four since 1963. Ultimately, the Ramblers didn’t win it all, but as but as they busted their way through the brackets, the “Cinderella” team wasn’t just lucky. It used steel tip boots and a killer instinct to sink fear into the hearts of much better known, better funded opponents. In short, the Ramblers were easy to love—unless you had to play them. More importantly, the five largest technology and internet stocks account for more than 14 percent of the S&P 500 index weighting. Investors are struggling to reconcile their love of tech products (and earnings) with their fear of tech’s lofty valuations. That’s the conundrum. Is the entire tech sector overvalued or just the dominant FAANG stocks (Facebook, Apple, Amazon, Netflix and Google)? The volatility we experienced in the year’s first quarter may have been unsettling, but many investors are out of practice feeling nervous. In my opinion, the volatility was actually quite normal in light of the exceptionally calm year we had in 2017. At the end of the day, market returns come down to earnings. Nearly 90 percent of tech stocks beat their revenue estimates in the 4th quarter of 2017—tops among all sectors. In fact, it was the best quarter for tech stocks in five years and CIO expectations for tech spending were at the highest level in 14 years, according to a Sanford Bernstein survey of chief information officers. Is it better to be loved or feared? For technology stocks, 2018 will tell the story. It appears based on technology stock revenues and earnings, the near term looks positive for the sector. But it seems that the same Wall Street pundits and analysts touting international economic growth are the ones tilting negative on tech valuation. That’s further puzzling since the tech sector gets over 50 percent of its revenues from international markets. 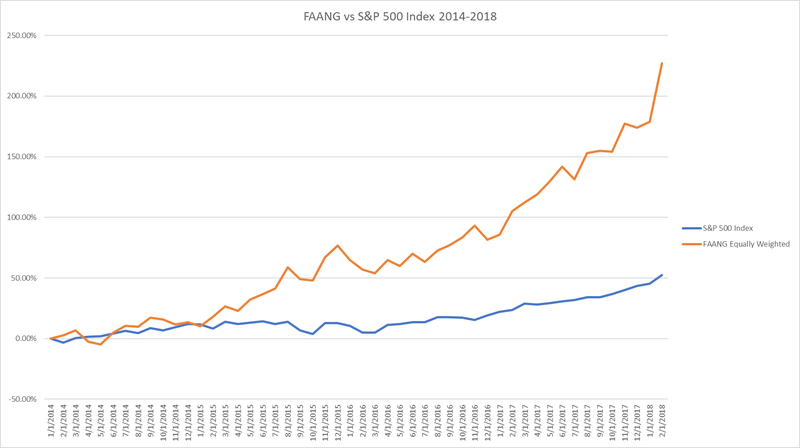 ARE ALL TECH STOCKS EXPENSIVE OR JUST FAANG STOCKS? 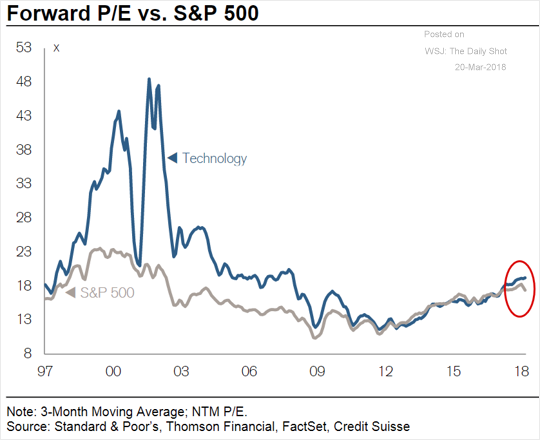 Tech valuations do not appear to be significantly richer than the overall S&P 500 index. IS THE TECH SECTOR IN A 1999 BUBBLE? I started my career in 1997 on a trading desk during the height of the Internet bubble. My firm was a small-cap tech-oriented shop, so my introduction to the world of trading was a technology-stock version of baptism by fire. Regular readers of this letter know I don’t like making predictions, but I have to get this one off my chest: If you ask me, today’s market is absolutely nothing like the 1999 bubble! I remember those exuberant dot-com days like they were yesterday. Once, while waiting for my car to be serviced in 1998, the mechanics kept running off the shop floor to check their diagnostic computers in the main office. At first, I feared my car was in big trouble, but I later learned the mechanics were using the office computers to day-trade stocks. Back then we heard stories of landscapers routinely leaving their jobs to day-trade at 100-to-1 intraday leverage. And today, we believe these same investing amateurs, having been burned, keep all their money at Vanguard and swear by passive indexing. Granted, tech sector valuations are not cheap today, but I find it’s tough to support an argument that we’re in bubble territory. The P/E for technology stocks is 19-times next year’s earnings. 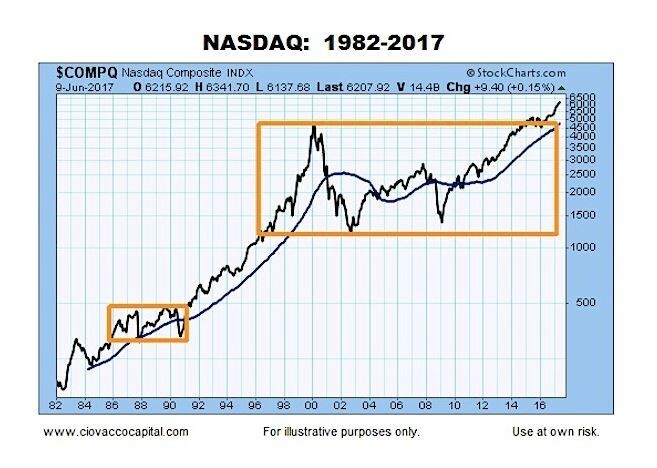 Compare that to a 17.7x multiple for the S&P 500 index and a 54x multiple for tech stocks during the March 2000 bubble. Even after a torrid start in 2018, tech stocks trade on par with their 20-year price-to-book ratios relative to the S&P 500. And based on price-to-earnings ratios, tech stocks carry a valuation that is 22 percent below their 20-year historical average relative to the S&P 500. The debate over offense vs. defense is not just for basketball in March. The most offense-minded sector (technology) has pulled off one of the biggest blowouts in market history relative to the defensive-minded consumer staples sector. As the chart below shows, over the past half-decade, Tech has outpaced Consumer Staples by a whopping margin of 158 percent to 33 percent—reminds me of a UCLA basketball score from the late 1960s and early 1970s. The chart below shows the tech sector in red and the consumer staples sector in blue. When the next bear market hits, it’s likely defensive sectors will take leadership and new sectors will spearhead the next bull market. Markets are an exercise in rotation. The way I see it, there is always a bull market somewhere–timing and emotion is what matters most. 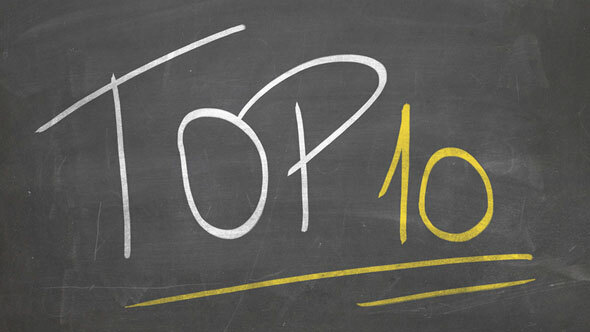 When will value stocks take leadership over growth stocks? Will international outperform domestic over the next three years? When is the next sector leadership rotation? Will techfall from the top sectors? They’re “following the herd.” For instance, in the first quarter of 2018, tech had the highest sector inflows since 2000. We live in a global technology driven world in which many jobs and tasks, not to mention employees, are being replaced by technology. This has led many people to question whether the five dominant FAANG stocks have become modern day monopolies. The conundrum is that the rest of the tech sector aside from FAANG stocks is expensive–but not in a 1999 Bubble kind of way. How do you rectify this in a world that’s being rapidly divided into learners and non-learners? Especially when the learners are technology driven. Is the tech leadership real or an illusion? We shall see in 2018 if the good times continue to roll.